May continued the trend for a colder than normal start to 2013. Night-time temperatures were quite low with seven ground frosts, which can damage planting at this time of year. We also had a particularly wet day on the 14th, with 27.3mm of rain falling in less than 24 hours. April also continued the trend of very cold months with a mean of only 7.4C which is still 0.8 C below the month’s normal temperature. There were 10 consecutive ground frosts from the 1st onwards, and six air frosts. However, it was a very dry month, with only 20.6mm of rain falling – that’s only 31% of the local average. Sunshine levels were near normal at 129.9 hours. The trend for colder than average weather seems to be still present into the next month. Due to anti-cyclonic weather in the Atlantic, the chances are of more northwesterly winds or westerlies, which give more showery and less warm weather. Further into June is difficult to predict – there may be a chance of a warmer southerly airstream later in the month. 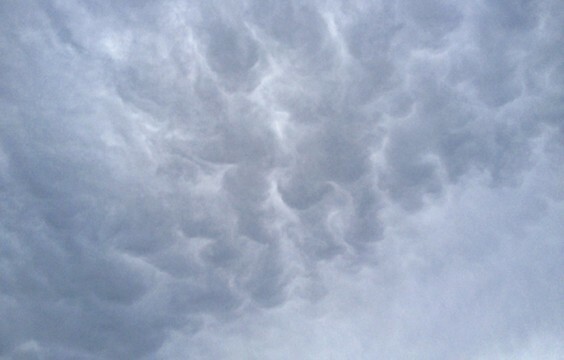 Pictured: Mammatous clouds over Alvechurch after a shower.